James Madison was born at Port Conway Va. 10 March 1751 and graduated from the College of New Jersey (now Princeton) in 1771. He was a member of the Virginia Council of State and in 1780 became a member of the Continental Congress. An early advocate of increased Federal power under the Articles of Confederation Madison served in the Virginia House of Delegates 1784-86 and was instrumental in securing passage of Jefferson's religious freedom bill. He played an influential role in the movement which led to the Constitutional Convention drafted the "Virginia Plan" which became the core of that document and worked tirelessly for its adoption. A first-rate thinker and writer on political theory and practice he was the author of 29 of the famous Federalist Papers. Madison served in the House 1789-97 and proposed the first 10 amendments to the Constitution which became the Bill of Rights. Later as leader of the Jeffersonian Republicans he drew up the Virginia Resolves and condemned the Alien and Sedition Acts. After being Secretary of State under Jefferson 1801-09 he was elected President. His first term was marred by the unpopular War of 1812 and his administration was marked by a trend toward nationalism. President James Madison died 28 June 1836 but continues in fame as one of the Nation's most important thinkers and statesmen.. The second James Madison (SSB (N)-627) was [laid down 5 March 1962 ] launched 15 March 1963 by the Newport News Shipbuilding & Dry Dock Co. Newport News Va.; sponsored by Mrs. A. S. "Mike" Monroney wife of U.S. Senator Monroney of Oklahoma; and commissioned 24 July 1964 [Vol. IV errata: 28 July 1964] Comdr. Joseph L. Skoog Jr. (blue crew) and Comdr. John C. Lewis (gold crew) in command. The two crews in turn conducted shakedown operations at sea. Completely successful launches of A-3 missiles climaxed the cruise of each team. After post-shakedown repairs and modification in November and December of 1964 James Madison sailed for her first patrol 17 January 1965. Reliability accuracy undetected mobility and instant readiness are the words which characterize Polaris ships and their crews. By the end of 1966 James Madison had completed her 10th patrol and she continued to serve in the European area helping to prevent war. Her men may be proud that James Madison - by providing a seagoing platform for weapons the traditional function of a warship - is an instrument of diplomacy and a keeper of the peace. 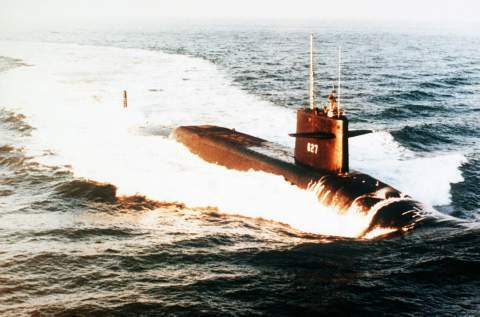 [Transcriber's note: James Madison was completed with the 2500-mile range Polaris A3 and she was refitted with the Poseidon missile between 1969 and 1978. In 1979-82 she received Trident I missile.